Copper fist is an N-terminal domain involved in copper-dependent DNA binding. It is named for its resemblance to a fist. It can be found in some fungal transcription factors. These proteins activate the transcription of the metallothionein gene in response to copper. Metallothionein maintains copper levels in yeast. The copper fist domain is similar in structure to metallothionein itself, and on copper binding undergoes a large conformational change, which allows DNA binding. 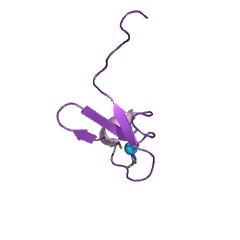 There are 1201 Copper-fist domains in 1201 proteins in SMART's nrdb database. Taxonomic distribution of proteins containing Copper-fist domain. This tree includes only several representative species. The complete taxonomic breakdown of all proteins with Copper-fist domain is also avaliable. Click on the protein counts, or double click on taxonomic names to display all proteins containing Copper-fist domain in the selected taxonomic class.